Warning/guarantee: my day job is with Entertainment Earth so yeah, draw your own conclusions regarding bias. 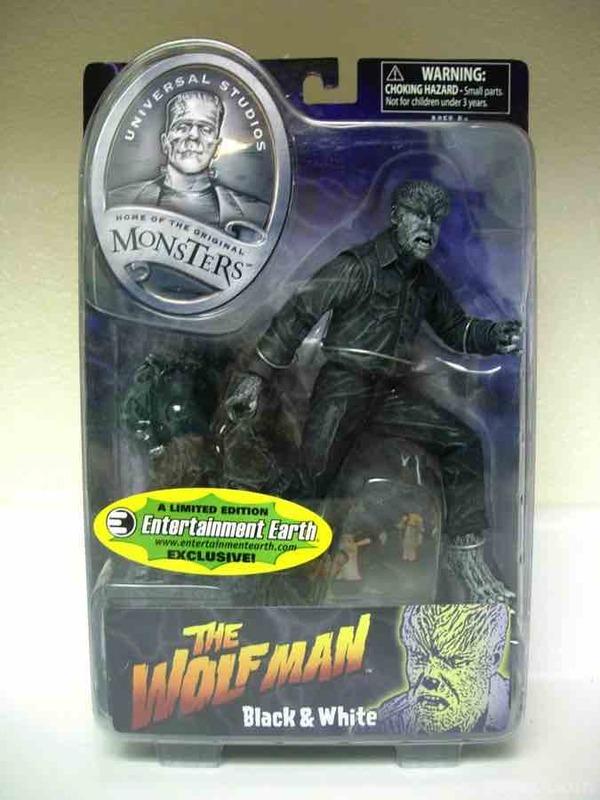 One of the most enduring licenses in the toy biz is the collective group of Universal Monsters, and this Wolfman is yet another proud entry in the series. We've seen block figures, faux-Mego figures, statues, model kits, high-end statues, and an obscene amount of knickknacks that could probably drive pretty much any collector nuts. That's one big benefit to there being a steady supply of new releases, you don't necessarily have to go back to 1941 for some non-existent collectible. You can just go to a store or online and buy something for a fair price. 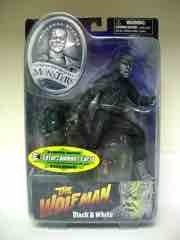 Heck, this figure is similar to a Sideshow Toys (before they were Sideshow Collectibles) release from the early 2000s. While Sideshow's 8-inch plastic figure was really dark and nicely detailed, this new 6 3/4-inch Diamond Select version has a little more contrast and because of this added brightness, seems a little livelier and a little less ghoulish. The paint applications are clearly more complicated, and the sculpt (with its enhanced articulation) feels a little less stiff. 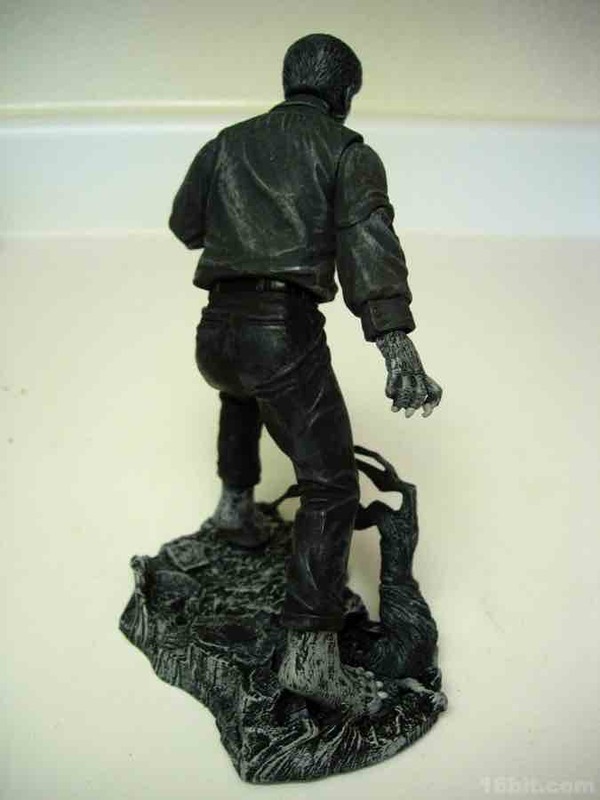 This diorama base is simpler, and lacks a nameplate-- which is actually just fine, because really, who the Hell doesn't know that this is the Wolfman just by looking at it? 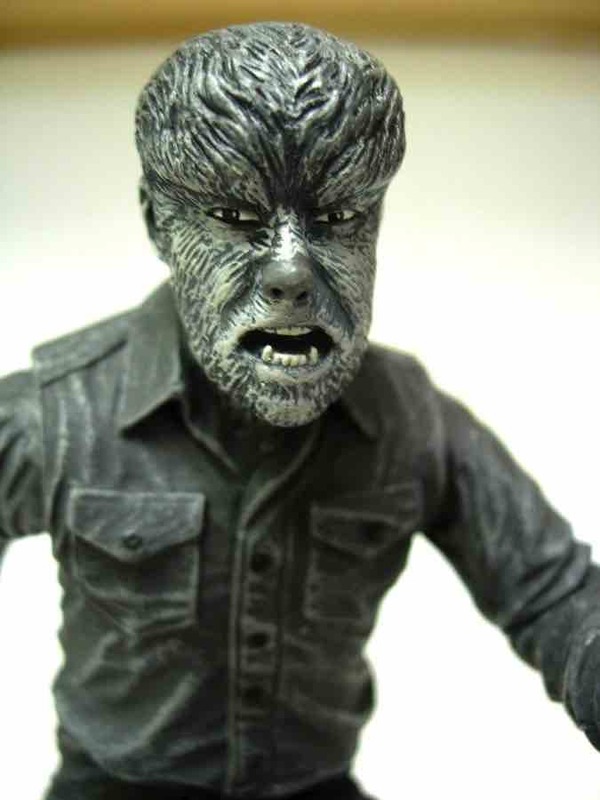 If lycanthropy isn't on your pop culture radar after the Twilight, Harry Potter, and Werewolf Bar Mitzvah franchises, really, you have no business buying this stuff. 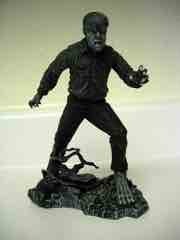 The figure has more in common with Hasbro's late great Star Wars Unleashed large-scale figure statues than it does a regular action figure. Since the figure has no articulation below the waist, I really don't understand why Diamond Select doesn't market this kind of product as a value-priced statue rather than a high-end action figure-- perception is everything, and as a statue this is a fantastic piece for the price. In addition to his waist, he has hinge elbows, swiveling wrists, quasi-ball shoulders, and an articulated neck. You can achieve some nifty poses with the figure on his display base, but the design of the figure is going to prevent him from doing a lot of interaction with your other toys. 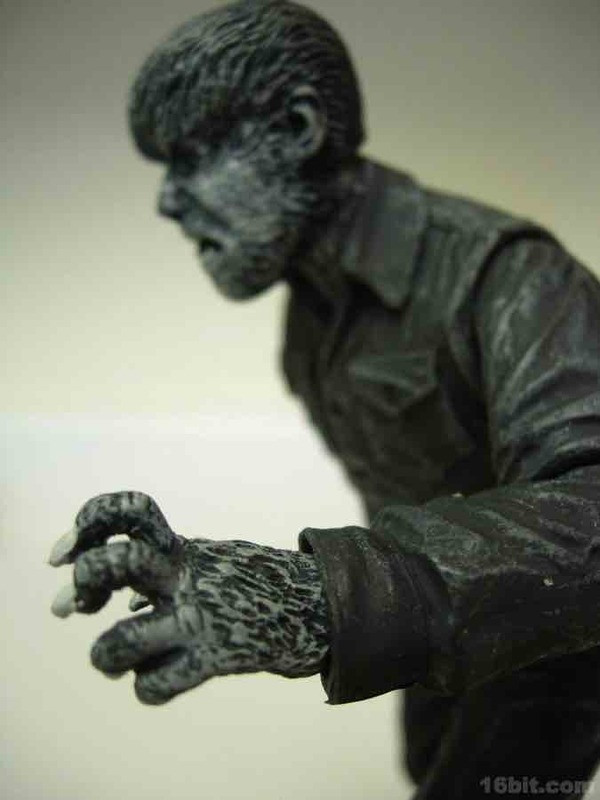 This is an ideal figure to keep around on a desk, but it'd probably be pretty upsetting to give to a kid-- it looks nice, but there's not too much else you can do with it. In short, it's totally fine to judge this one by its looks, as it isn't fragile and it looks just as good as you might hope. I like it. It didn't blow me away, but it didn't disappoint me either-- and at press time, it's still available. 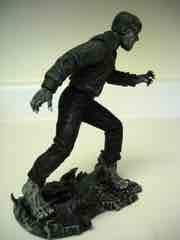 The black-and-white version is exclusive to Entertainment Earth, while Toys "R" Us has the colorized version. One final note, the figure has a two-piece display base. 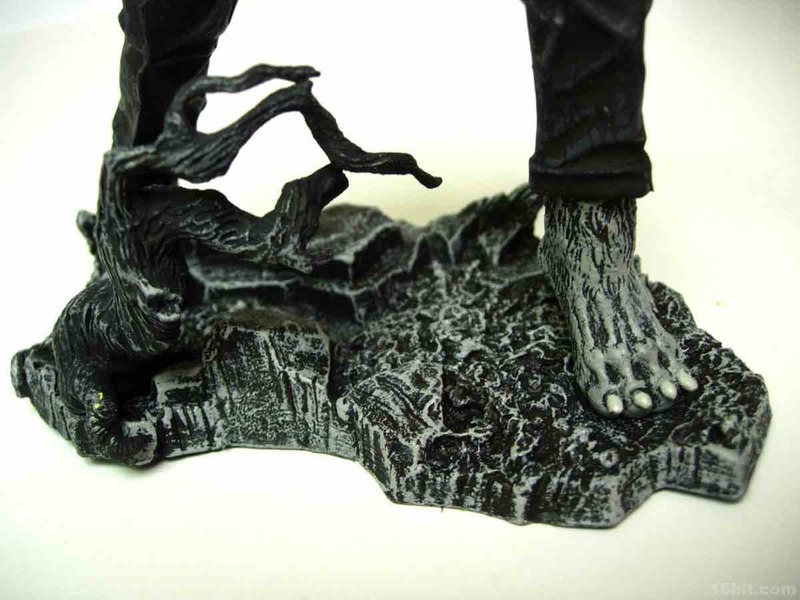 The branches near his feet need to be plugged in to the forest base.